1. Cabinet’s Economic Coordination Committee (ECC) recently approved import of cotton from Afghanistan and central Asian countries through the land route to meet its shortfall in the textile sector. 2. The Pakistan Textile Exporters Association (PTEA) has demanded immediate release of outstanding duty drawback of taxes (DDT) claims to enhance exports. PTEA Chairman Khurram Mukhtar said the cash crunch had squeezed the financial stream, making it tough for exporters to meet commitments. 3. Central Cotton Research Institute’s (CCRI) variety Bt CIM-632 received the commercial license recently and farmers can now cultivate this variety to increase production. The license was issued by the Punjab Seed Council. The variety was tested by CCRI for two years and approved by the National Coordinated Varietal Trial (NCVT), a national level forum of scientists. 4. The All Pakistan Textile Mills Association (APTMA) has urged the government to ensure low cost of inputs to cotton farmers, implement a law relating to zoning system. This will ensure a quick supply of quality cotton seed and extension services to farmers. 5. 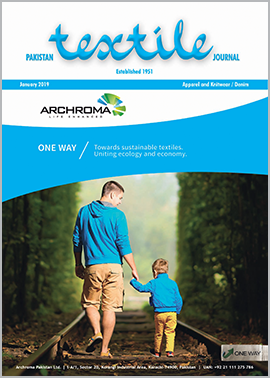 Archroma Pakistan, a global leader in colour and specialty chemicals was granted the award in recognition of Archroma’s best practice in human resource management, ethical marketing management, and corporate social responsibility. Archroma always strives to maintain the highest standards in occupational safety and health fostering environmental protection through recycling and reuse. 6. Islamabad Chamber of Small Traders said troubled Pakistani textile industry considered as the backbone of the export sector is facing new challenges which should be dealt with promptly. 7. The textile industry crumbling under high energy prices, stuck up refunds and tight monetary policy is facing tough competition from India, Bangladesh, Vietnam, Thailand and other countries in the international market. 8. Textile exports remained flat at $5.506 billion during the first five months of the current fiscal year of 2018-19 as the value-added sector couldn’t perform up to the mark despite constant rupee devaluation against the US dollar. 9. Pakistan’s cotton production can be raised up to 15 million bales if the Cotton Control Act is properly implemented, said Haji Muhammad Akram, Chairman of Pakistan Cotton Ginners Association (PCGA). He said Cotton production would be around 11.5-12 million bales this year with production in Punjab expected to rise and that in Sindh likely to fall.